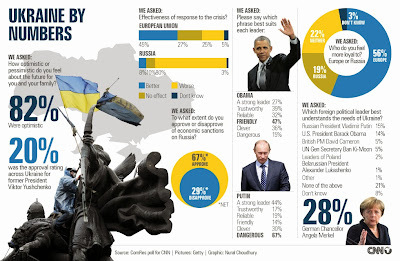 LONDON, England -- Ukrainians are a lot less pro-Russian than separatists there would like the world to believe, even in regions along the border with Russia which are supposedly voting overwhelmingly to declare independence from Ukraine, a new poll for CNN suggests. The people of Ukraine feel much more loyal to Europe than to Russia, and a clear majority back economic sanctions against Russia, according to the poll of 1,000 people across the country conducted in the past week. Two out of three (67%) people in Ukraine approve of economic sanctions against Russia, while one out of three (29%) disapproves, the poll by ComRes for CNN found. Ukrainians tend to see Russian President Vladimir Putin as dangerous and a strong leader, while they consider U.S. President Barack Obama friendly. More than half (56%) said they felt a stronger sense of loyalty to Europe than to Russia, while 19% said they felt more loyal to Russia and 22% said neither. Three percent said they didn't know. The results come a day after pro-Russian separatists in the east of the country said people there had voted overwhelmingly in favor of independence from Ukraine, in a referendum denounced by the United States and its European allies. The CNN poll found that even in eastern Ukraine, a minority of people back an alliance with Russia. Just over a third (37%) of Ukrainians in three eastern regions favor an alliance with Russia, while 14% of the region backs an alliance with the European Union and about half (49%) say Ukraine would be better off if it did not ally with either, the poll found. "Eastern Ukraine" includes the regions of Donetsk, Luhansk and Kharkiv, which are generally seen as among the most pro-Russian areas in the country. Donetsk and Luhansk held referendums on independence on Sunday, with an election official in Donetsk saying Monday the region had voted 90% in favor. Nationwide, a slight majority (54%) said it would be good for Ukraine to join the EU. More than eight out of 10 (82%) said it would be bad for the country to have Russian troops in Ukraine. And despite the crisis that has pitted Russia against the United States and European Union over the fate of the second-largest country in Europe, Ukrainians are optimistic about the future. Two out of three people said they were optimistic about the political future of the country (65%) and the same proportion (67%) said they were optimistic about its economic future. Nearly half (44%) of respondents to the CNN poll said Putin was a strong leader, compared to 27% who saw Obama that way. About a quarter (23%) said neither and six percent said they didn't know. Two-thirds (67%) described Putin as "dangerous," while only 15% saw Obama that way. But Obama came out well ahead of Putin as "friendly," with 47% applying the description to the U.S. President and only 14% saying it of Putin. About a third (34%) said neither was friendly, and five percent said they didn't know. Neither leader came across as especially reliable, with 32% choosing Obama, 19% choosing Putin and 45% saying neither. The findings, by the London-based agency ComRes for CNN, come from a nationally representative telephone poll of 1,000 Ukrainians conducted by telephone in Russian and Ukrainian from May 7-11.